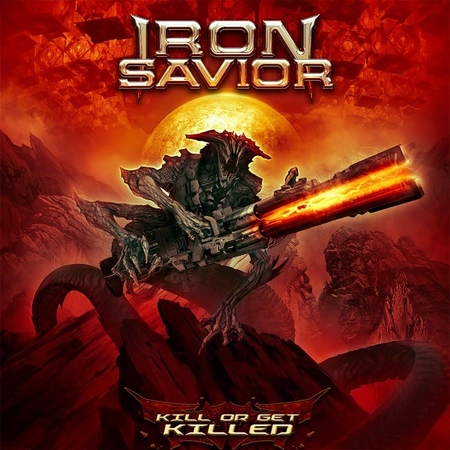 German power metal band Iron Savior released their tenth studio album, “Kill or Get Killed” on 15th March via AFM Records. The band’s album have always had a focus on science fiction story telling and the new album is no exception; although there is a new theme this time around. Over the years there has been a number of line-up changes but singer/guitarist/producer and founding member Piet Sielck has remained constant throughout. The track “Stand Up and Fight” was included on the Friday NI Rocks Show on 15th March. Iron Savior was founded in 1996 by Piet Sielck along with guitarist Kai Hansen from Helloween/Gamma Ray and Blind Guardian drummer Thomen Stauch. The band’s self-titled debut album was released in 1997 and told the story of a spaceship called Iron Savior. This was to provide the subject matter for many of the following albums. Sielck also played bass on that first album but Jan-Sören Eckert was brought into the band in 1998 and is part of the current line-up (having departed for a while between 2002-2011). Initial members Stauch and Hansen left Iron Savior in 1998 and 2001 respectively, the latter after recording three albums with the band. Current guitarist Joachim ‘Piesel’ Küstner joined the band in 2000. There have been several drummers over the past twenty years, with current member Patrick Klose joining in 2017. The tracks on the latest album continue to have a sci-fi focus but the subject matter has changed and this time they are inspired by the book “The Star of Pandora” which is about the destruction of humanity by an alien civilization.